This Bowl-dacious Second Chance ArtBra was created by a group of ladies participating in one of the Artists’ Loft’s Create to Donate workshops. 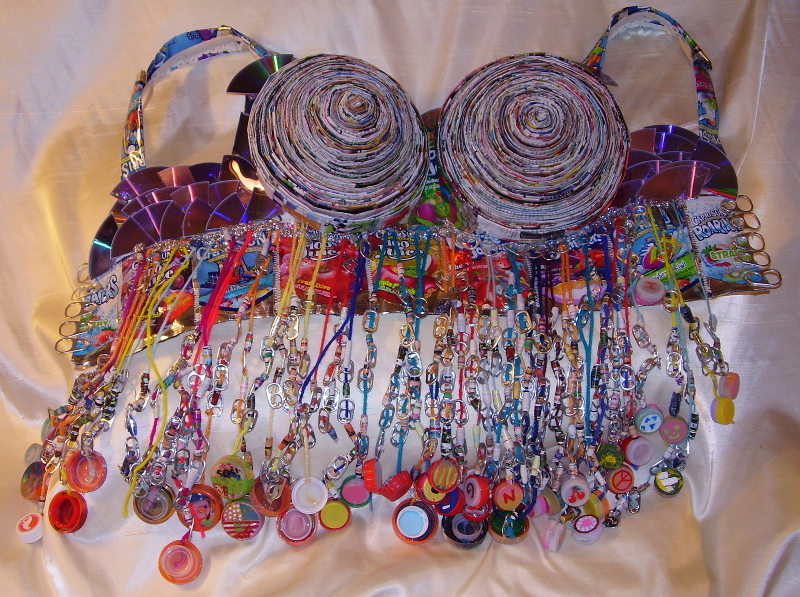 It was made from mostly recycled materials, including old magazines for the bowl-shaped cups, old juice containers for the bodice and straps, water bottle tops and soda can tops for dangling decorations, and old CDs for some additional sparkle! The bra came together as a collective effort from women who suffered from breast cancer themselves or knew someone who had. It was a fun and therapeutic way for the women to express their creativity and do something that would ultimately help others. Their inspiration came from the hope of giving a “second chance” to all those fighting breast cancer. About the Artists’ Loft/Create to Donate: The Artists’ Loft is a 501(c)(3) non-profit organization that strives to bring people together through the arts. Their mission is to provide professional art instruction to students of all ages in need of technical advice, stress relief, a confidence boost and companionship. Through their lessons, they also encourage compassion, the act of giving, self-expression and generosity. They offer year-round, after-school fine art lessons, an annual summer art camp, an outreach program for various hospitals, senior centers and support groups, and also a Create to Donate program where students’ projects are donated to hospitals, shelters, etc., or are sold to benefit our organization or the cause the project was designed for. For more information, please visit: www.theartistsloft.org.